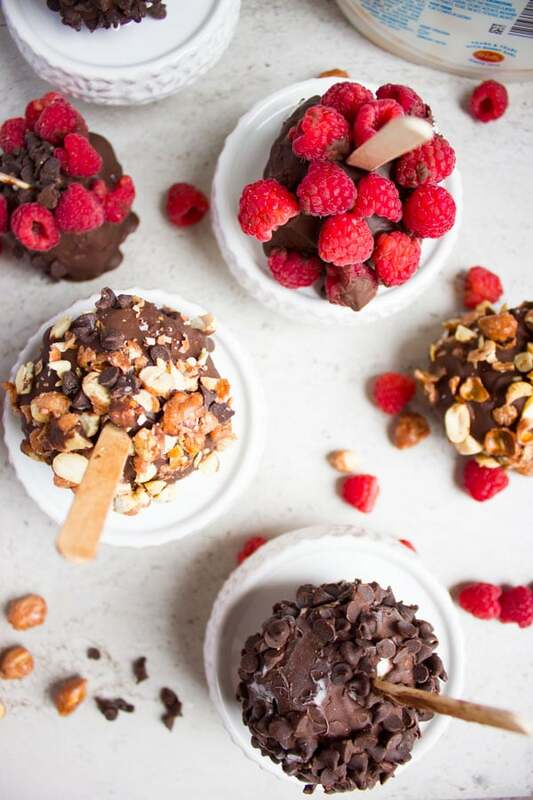 Can you guess what’s hiding in those scrumptious Homemade Ice Cream Pops? It involves Vanilla, Peanut Butter and Chocolate. Plus a secret technique for ice cream fun all summer long! 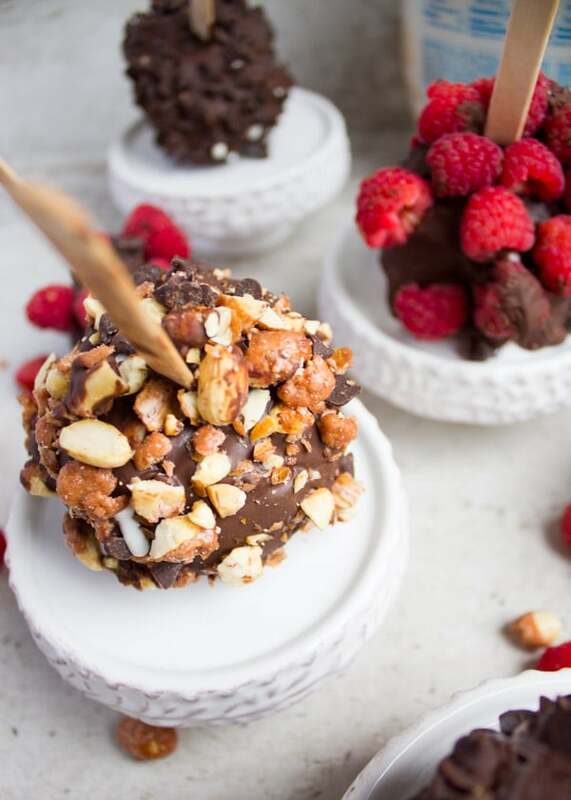 Can you believe that this amazing treat takes 15 minutes of work while your freezer does the rest?! YES! I am excited for this post like nothing else. 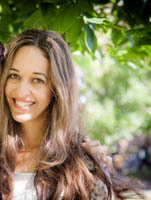 It involves some of my favorite things in life—Ice cream and Chocolate! I love treats like those homemade ice cream pops since they’re perfect for kids and grown ups at the same time. It’s always a plus when you have people over and you don’t need to think which dessert is best for each group. I don’t know what it is, but I think those pops bring out the kid inside all of us. And today’s recipe has seriously the BEST combo of flavors and textures! There’s something about homemade ice cream goodies that’s absolutely worth every second of making it! And since they’re super easy, why not? While I know it isn’t summer yet, we absolutely devour ice cream in Spring too! Frankly even in winter, there is no fixed season for ice cream in my house. lol. And I blame my dad for this! So imagine how all of us (ok, most of us) need to wake up with that cup of coffee, likewise my dad has to finish off his evening with a big bowl of ice cream! So it’s only normal (and genetic) for us to carry on this LOVE! And frankly who would resist ice cream everyday? Another favorite of mine is this MUST try Homemade Summer Ice Cream Cake: it’s a recipe (and technique) that’s always requested at the cooking school and my class sells out each time it’s on the menu! 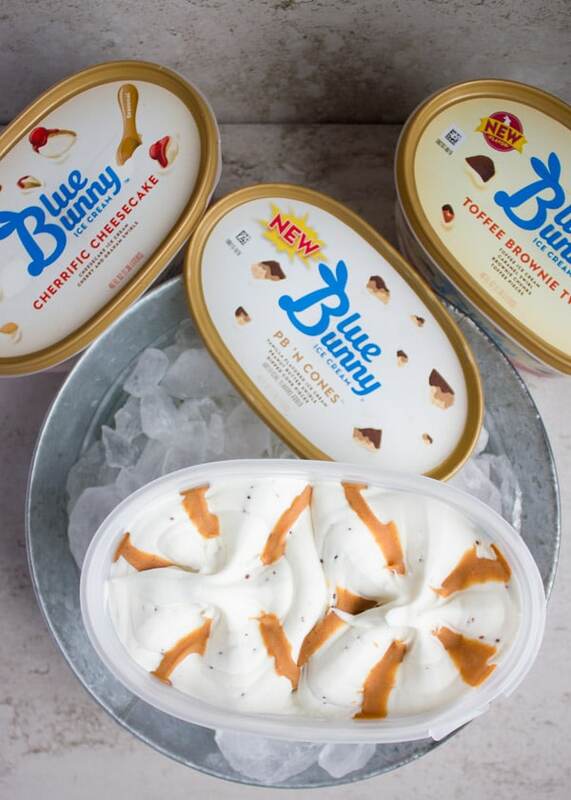 It’s not an AD but I seriously love Blue Bunny Ice creams ever since I discovered them! I feel so many of my friends and family got hooked on to it too after I made these ice cream pops with it! 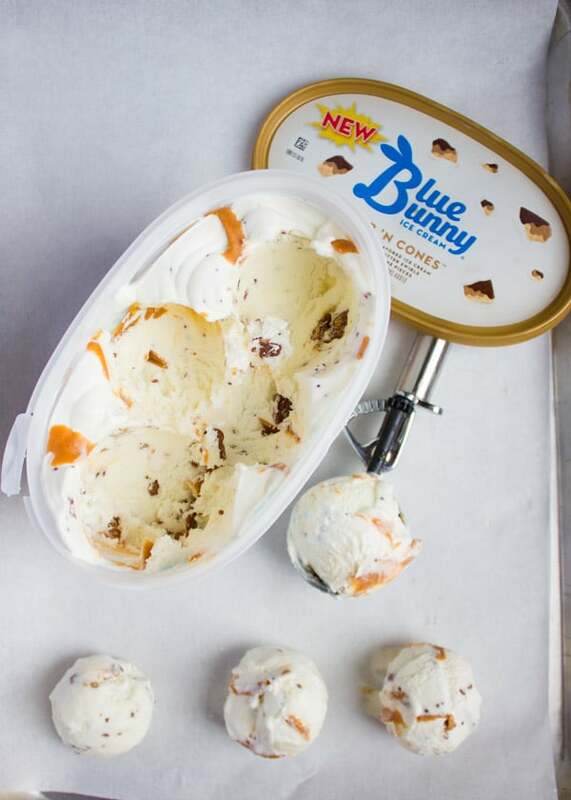 This pops ice cream recipe involved the PB N Cone flavor. Which is a swirled peanut butter ice cream in a avnailla base ice cream and chunks of ice cream cones. I don’t even know how they seriously come up with these flavors! Mind boggling! Haven’t tasted a single flavor that I didn’t love. Even at times my hubby would buy a flavor that I wouldn’t probably pick, as soon as I would taste it, I would LOVE it! And the only reason is, the quality of ice cream is absolutely AMAZING! You can’t not love it. After you settle on which flavor you’ll be using (or maybe more than one flavor), then you’ll scoop out any size ice cream scoops in to a parchment lined baking sheet. After scooping your ice cream, you’ll stick a wooden ice cream stick in the centre of each scoop (even a lollipop stick would work) then pop the sheet into the freezer for the scoops to really harden. 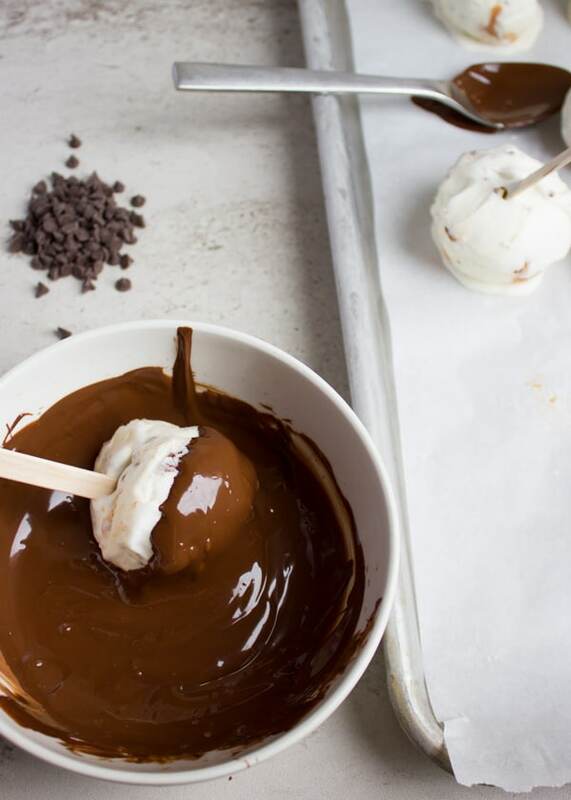 This step is important to get the chocolate coating to stick to your scoop in seconds with no melting and no fuss. In the meantime, you’ll melt some chocolate in the microwave or over a water bath. I used a fifty fifty ratio of milk and dark chocolates—to me that’s what I absolutely love. But if you’re a dark chocolate person, then just go ahead and use only that. 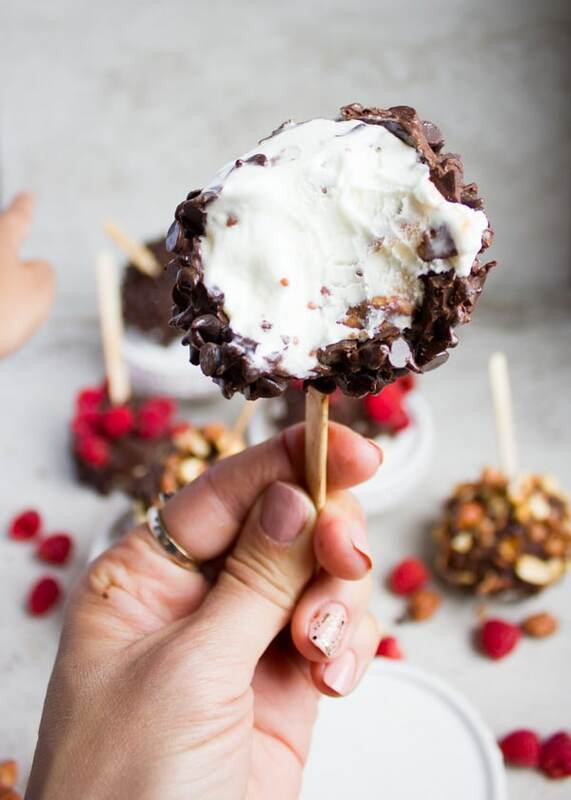 Finally, just take one pop ice cream one at a time and dip it in chocolate, and quickly sprinkle any extra toppings you like. The toppings are endless here so feel free to get creative! This recipe can easily be made into ice cream bars or ice pops. You need to have the popsicle mold and you’re good to go! Just follow the same idea of softening the ice cream and scooping it in to a popsicle or bar shape. Freeze and then dip in chocolate. Finish off with your choice of toppings and there you have it. Perfect Ice cream bars. But I’s pick these pops over bars anytime! Oh and I’ve saved the best for last, here’s biting in to it!! YUM! Start with quality store bought ice cream or homemade ice cream recipe if you prefer. Your ice cream has to be softened up a bit and easy to scoop, and later , the scoops need be really hard to they don’t fall apart as you proceed. 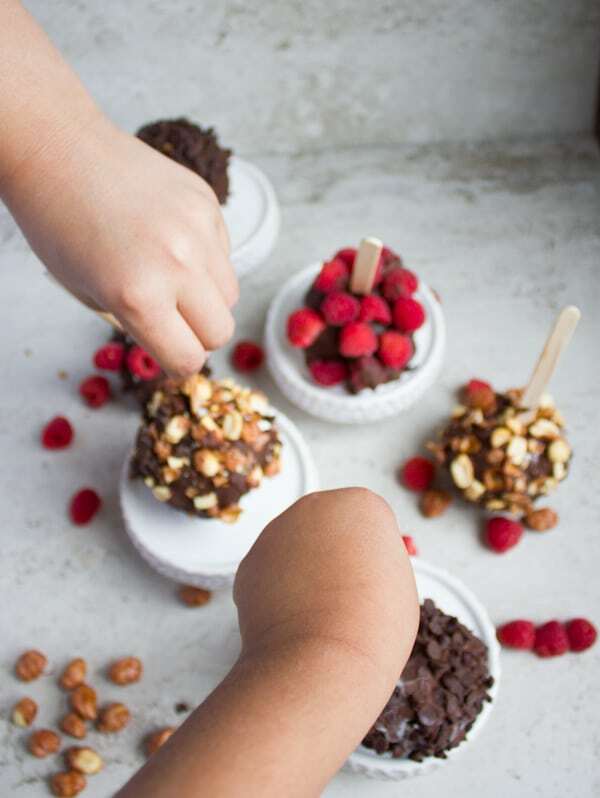 If you don’t have ice cream sticks, use lollipop sticks or wooden skewers. But in that case, adjust the size of the scoop so it’s not too big for the sticks. Use as many sprinkles and topping as you wish after dipping in chocolate! 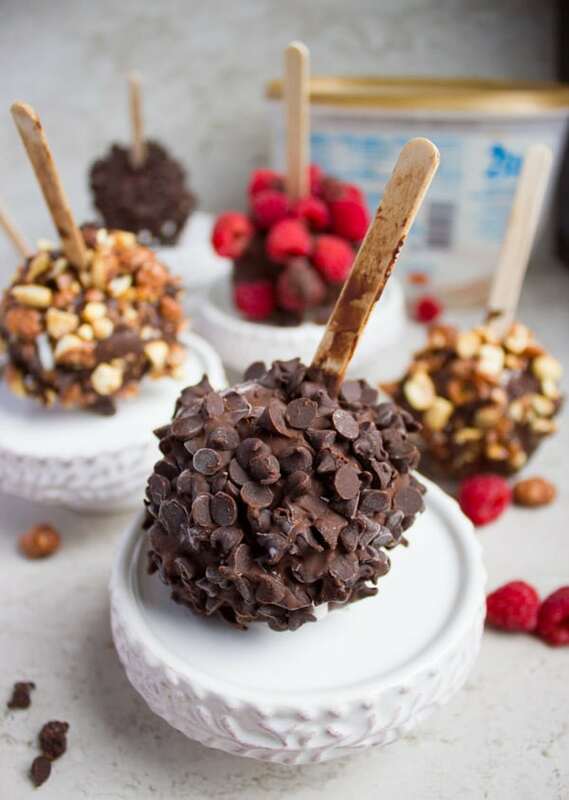 Enjoy these right away or freeze until ready to serve! 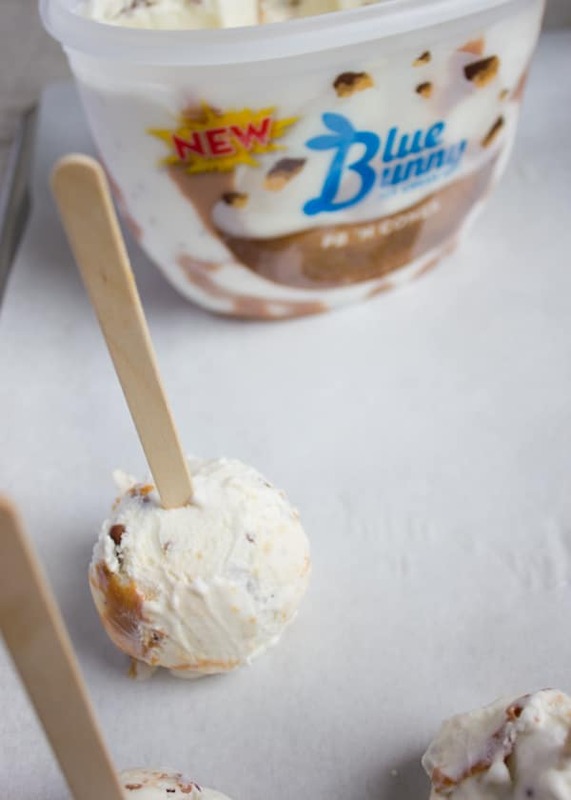 Take the Blue Bunny® PB 'N Cone™ from the freezer and take your favorite sized ice cream scoop. On a parchment lined baking sheet, scoop out the ice cream and leave about half an inch border between each scoop. 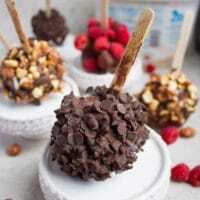 Place an ice cream stick int he centre of each scooped ice cream ball and push it down until it reached the end. Freeze the baking sheet with the ice cream scoops for at least 45 minutes until it hardens. In a microwave or over a water bath, melt the chocolate chunks until runny. When the ice cream is ready, quickly take one at a time and dip it in the chocolate, then sprinkle any topics you prefer over it. 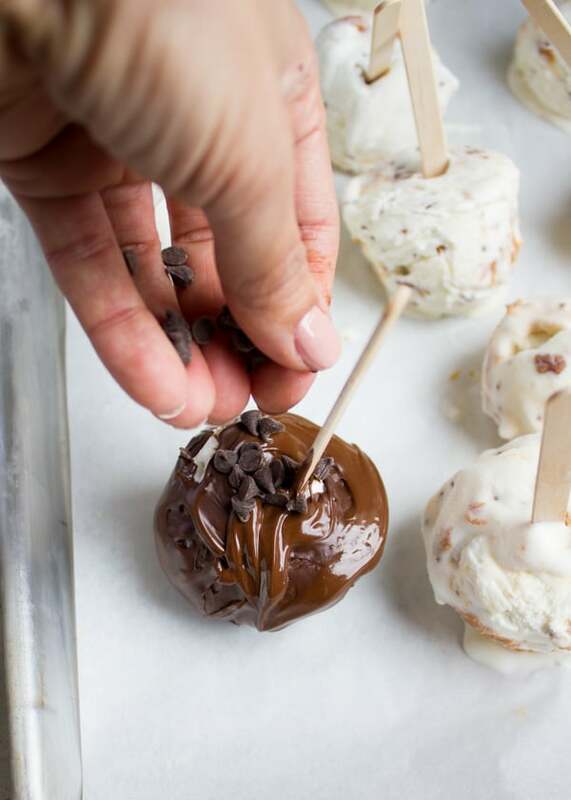 Place the ready dipped ice cream pos in another baking sheet lined with parchment and place them back in the freezer. Repeat with the remaining ice cream pops. If the chocolate begins to harden, place the bowl back in the microwave for 30 seconds or over the water bath to melt again. Your ice cream has to be softened up a bit and easy to scoop, and later , the scoops need be really hard to they don't fall apart as you proceed. 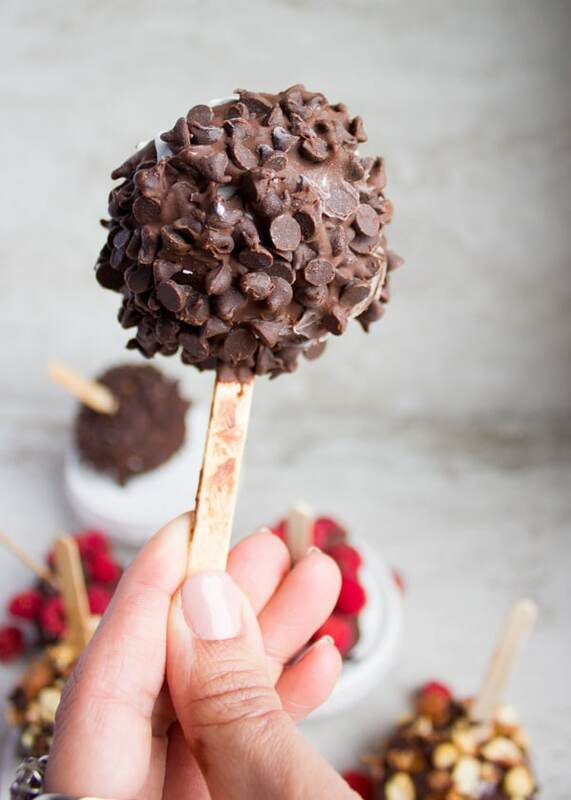 If you don't have ice cream sticks, use lollipop sticks or wooden skewers. But in that case, adjust the size of the scoop so it's not too big for the sticks. Thanks Mary–these were one of my favorite treats ever!